MoldSTAT Protector concentrate dilutes to make 9 times more mold prevention spray prevents the return of mold for up to 3 months with an anti-microbial layer of defense. 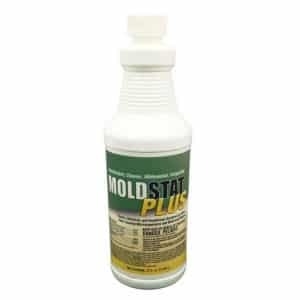 Proudly made in Florida, MoldSTAT Step 3 – Protector Concentrate is manufactured in the USA. NO Bleach, Chlorine, or LYE..
MoldSTAT Barrier ships FREE to any postal address in the US. After our basement flooded, the disaster recovery guy gave us the tip to use moldstat barrier to prevent regrowth of mold while the basement continued to dry. It would have cost $450 for the 6 month service from the professionals. Instead we bought 6 quarts and for the same coverage and saved over $300. Thanks for offering professional product direct to consumers. I have mold on a bookcase where the airconditioner dripped, will this work? You can safely use Barrier Mold Killer anywhere water can be used. No need to worry about bleach harming your bookcase’s sensitive wood finish, MoldSTAT Barrier doesn’t contain bleach. MoldSTAT Barrier combines a EPA registered mold killer that stops mold cold and a anti-microbial mold protector that discourages the regrowth of mold. Apply Barrier, wait 10 minutes then wipe away the dead mold. Re-apply a thin coat of Barrier for further anti-microbial mold prevention every 6 months.